The gardens, which featured on BBC’s Gardeners World, are renowned for the Monet style Japanese Bridge which overlooks a National and International Collection of Water Lilies (one of only six in the world) and recreating an image from Claude Monet’s famous painting Water Lily Pond 1899. This offers a chance to have your picture taken inside an impressionist painting. These long established gardens founded by the Bennett family in 1959 offer a unique and stunning setting in natural surroundings. Native trees, weeping willows, palms and wild flowers provide a spectacular backdrop for your wedding photography. The gardens, which featured on BBC's Gardeners World, are renowned for a Monet style Japanese Bridge which overlooks a National and International collection of water lilies (one of only six in the World). Like an image from Monet's famous painting ‘Water Lily Pond 1899’, it offers you a chance to have your picture taken inside an ‘impressionist painting’. This eight acre site is still run by the Bennett family today, who provide a friendly and personal approach and ensure you have a truly memorable wedding day in relaxed and magical surroundings. 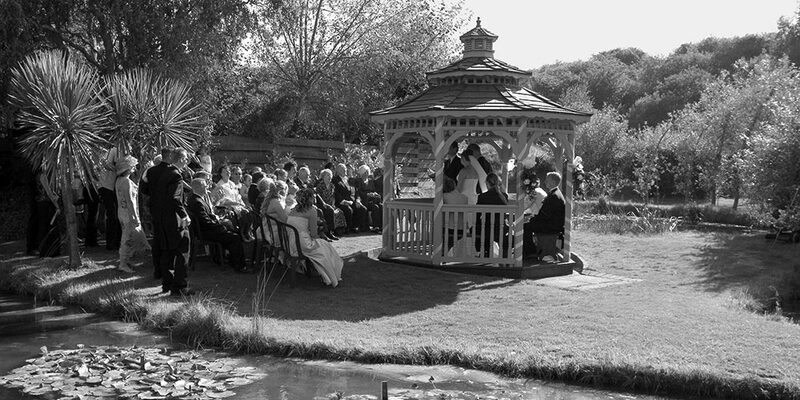 The very first wedding ceremony held in the Gazebo was on Saturday 3rd September 2005.